Tranexamic acid is an antifibrinolytic agent, which competitively inhibits the activation of plasminogen to plasmin. Short-term use for haemorrhage or risk of haemorrhage in increased fibrinolysis or fibrinogenolysis. la. Prostatectomy: Prophylaxis and treatment of haemorrhage in high risk patients should commence per- or post-operatively with an SAVIBLEED Injection; thereafter 2 tablets three to four times daily until macroscopic haematuria is no longer present. lb. Menorrhagia: Recommended dosage is 2 tablets 3 times daily as long as needed for up to 4 days. If very heavy menstrual bleeding, dosage may be increased. A total dose of 4g daily (8 tablets) should not be exceeded. Treatment with 5AVIBLEED should not be initiated until menstrual bleeding has started. le. Epistaxis: Where recurrent bleeding is anticipated oral therapy (2 tablets three times daily) should be administered for 7 days. Id. Conisation of the cervix: 3 tablets three times daily. 2. Haemophilia: In the management of dental extractions 2-3 tablets every ei ht hours. The dose is based on 25 mg g.
3. 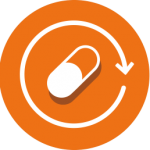 Hereditary angioneurotic oedema: Some patients are aware of the onset of the illness; suitable treatment for these patients is intermittently 2-3 tablets two to three times daily for some days. Other patients are treated continuously at this dosage. This should be calculated according to body weight at 25 mg/kg per dose. No reduction in dosage is necessary unless there is evidence of renal failure (see guidelines below). 120-249 15mg/kg body weight twice daily. 250-500 15 mg/kg body weight/day. In case of haematuria of renal origin (especially in haemophilia), there is a risk of mechani- cal anuria due to formation of a ureteral clot. In the long-term treatment of patients with hereditary angioneurotic oedema, regular eye examinations (e.g. visual acuity, slit lamp, intraocular pressure, visual fields) and liver function tests should be performed. Patients with irregular menstrual bleeding should not use Tranexamic acid until the cause of irregular bleeding has been established. If menstrual bleeding is not adequately reduced by Tranexamic acid, an alternative treatment should be considered. Patients with a previous thromboembolic event and a family history of thromboembolic disease (patients with thrombophilia) should use Tranexamic acid only if there is a strong medical indication and under strict medical supervision. The blood levels are increased in patients with renal insufficiency. Therefore a dose reduction is recommended. The information on renal insufficiency is contained in section 4.2. Patients who experience visual disturbance should be withdrawn frorn treatment. Clinical experience with tranexamic acid in menorrhagic children under 15 years of age is not available. 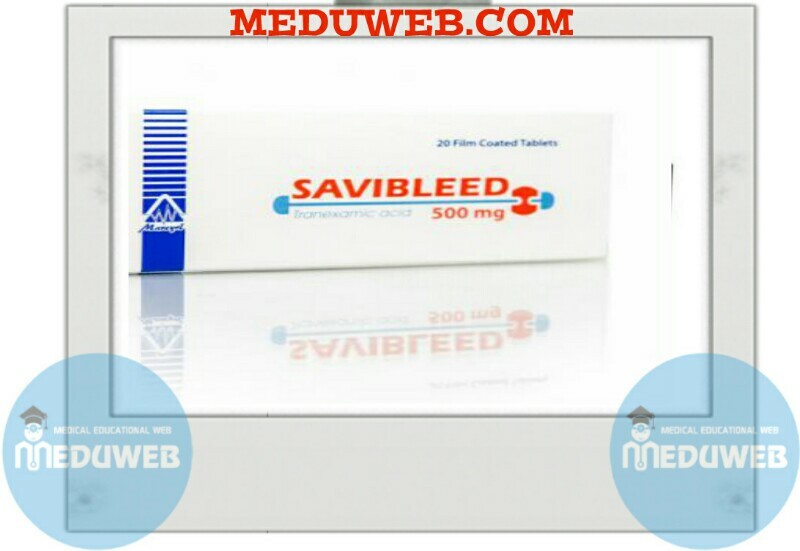 SAVIBLEED will counteract the thrombolytic effect of fibrinolytic preparations. Although there is no evidence from animal studies of a teratogenic effect, the usual caution with the use of drugs in pregnancy should be observed. Tranexamic acid crosses the placenta. reports, not known (cannot be estimated from the available data). Symptoms may be nausea, vomiting, orthostatic symptoms and/or hypotension. Initiate vomiting, then stomach lavage, and charcoal therapy. Maintain a high fluid intake to promote renal excretion. There is a risk of thrombosis in predisposed individuals. Anticoagulant treatment should be considered. Tranexamic acid is an antifibrinolytic compound which is a potent competitive inhibitor of the activation of plasminogen to plasmin. At much higher concentrations it is a non-competitive inhibitor of plasmin. The inhibitory effect of tranexamic acid in plasminogen activation by urokinase has been reported to be 6-100 times and by streptokinase 6-40 times greater than that of amiocaproic acid ; activity of tranexamic acid is approximately ten times greater than that of aminocaproic acid. Peak plasma Tranexamic acid concentration is obtained immediately after intravenous administration (500 mg). Then concentration decreases until the 6th hour. Elimination half-life is about 3 hours. Tranexamic acid is excreted in urine as unchanged compound. 90% of the administered dose is excreted by the kidney in the twelve first hours after administration (glomerular excretion without tubular reabsorption). Following oral administration, 1.13% and 39% of the administered dose were recovered after 3 and 24 hours respectively. Tranexamic acid crosses the blood brain barrier. Croscarmellose Sodium, Magnesium Stearate ,Hydroxypropyl cellulose 5 cps, Titanium Dioxide, PEG 6000, Talc, PVP 1<30, Aerosil 200, Povidone K30 , Pregelatinized Starch, Stearic acid.